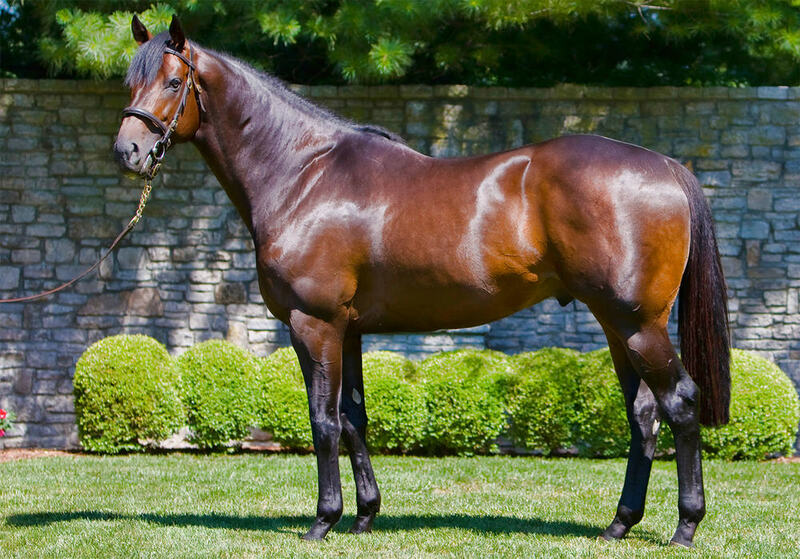 To have lost the stallion so abruptly last December, at the age of just 11, and after a year in which he sired 18 stakes winners, must now seem harder than ever to his owners. Presumably, after all, they find themselves in increasingly urgent need of classy outcross options for all their Galileo blood. But how marvellous that they seem to have been left a legitimate heir. For the superiority of Caravaggio to his rivals for the Coventry Stakes (Gr.2) had a nearer equivalence than may seem evident to that of Lady Aurelia when she broke loose in the Queen Mary Stakes (Gr.2). As Ryan Moore said afterwards, Caravaggio in effect won two different races: first obliged to impose himself on those he was tracking on the stands' side; and then taking off again, when artfully allowed to sway to his right, to run down the horses clear on the far rail. The margin back to the next home on the stands' side, who finished fifth, was over eight lengths, still greater, in other words, than that opened up in such surreal fashion by Lady Aurelia. The scrupulously unexcitable Moore permitted himself to acknowledge that no juvenile he has ridden would match Caravaggio at this stage of his career. The way his mount saw out a stiff sixth furlong on slow ground encourages you that he might get a mile, but perhaps the question of Newmarket next spring should be deferred. With so many dirt lines embedded in his family tree, and a style so evocative of his grandsire, you would not be surprised to see Caravaggio first try the distance in a very different environment this autumn, in the Breeders’ Cup Juvenile (Gr.1) at Santa Anita Park. By dint of running against each other in the Chesham Stakes (L), Cunco and Frankuus were bound to reduce the remarkable strike-rate of their rookie sire. In the event, they finished third and fifth respectively, Cunco giving another interesting glimpse of the short fuse that could be inherited along with any of that explosive brilliance. He was very headstrong to post, but a conservative tempo in the race itself did not prevent him channelling his energy into the same buoyancy he had shown on his debut at Newbury, again galloping out strongly. It will be remembered that Frankel himself, in his youth, resented any attempt to inhibit his stride and, if some of his stock do happen to have fairly precarious temperaments, then others may simply be straining to express themselves. Remembering his sire running amok in the 2000 Guineas (Gr.1), it would be interesting to see Cunco make the running next time. But it was Frankel's own, omnipotent sire who reiterated his seniority on this occasion. Preceded from Ballydoyle by much talk and more money, despite defeat on his only previous start, Churchill looks yet another top-class prospect for the great patriarch. Still extremely raw, he was unable to switch leads to correct a leftward drift once in front, duly only able to hold out by a half-length. Both his dam and granddam were very quick, so it remains to be seen how far his paternal genes can carry him, but at the very least he looks the sort to draw out more from a stronger gallop. All in all, with a very powerful physique, Churchill seems certain to put together a much more flamboyant performance somewhere along the line, as he becomes more professional. Tepin added versatility and pluck to her many proven assets in the Queen Anne Stakes (Gr.1), while her jockey Julien Leparoux introduced many fellow Europeans to the unsuspected genius he exported to the New World a few years ago. More parochial eyes, however, allowed themselves to focus on the performance of Lightning Spear in third. While Leparoux kept his mare handy, both the others who made the podium gave her a considerable start, and Lightning Spear, having raced freely on his first start since October, did especially well to finish off as well as he did. Having lost his way somewhat last season, and since joined David Simcock, he remains pretty lightly raced and, with that freshness out of his system, will be an interesting proposition in any company next time. Half full or half empty, the glass can always be recharged.